More than half the 6th grade students in six sub-Saharan African countries attend school in a classroom without a single book. 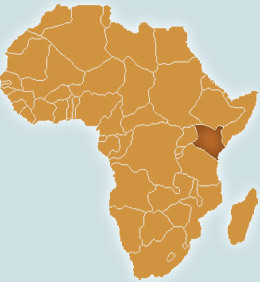 See a detail of Kenya and more information about our project locations. The world’s greatest concentration of poverty is in sub-Saharan Africa, where more than half the population survives on less than $1 a day. Not coincidentally, the region is also home to the greatest concentration of out-of-school children and lowest adult literacy rates in the world. However, it is not for lack of effort or commitment on the part of the African people. Public spending on primary education in sub-Saharan Africa rose by 29% between 2000 and 2005, and total primary school enrollment has increased by 42 million since 1999. Yet one quarter of African children – nearly 30 million of them – are still denied the opportunity to attend school because of economic, political, cultural or other barriers. The region accounts for 45% of the world’s out-of-school children. Dramatic increases in enrollment during the past decade have strained the capacity of schools and caused severe shortages in classroom space, adequately trained teachers and learning materials, including books. The result is more than 150 million adults – half the population of the United States – who lack the basic literacy and numeracy skills needed to earn a living wage and provide for their families. If Africa’s children are not given access to a quality education, adequate resources and appropriate learning materials, another generation will simply be left behind.